Global Journal of Life Sciences and Biological Research (GJLSBR) is an open access publication launched in the year 2015. This journal follows single-blind peer review policy. This quarterly journal invites authors to submit manuscripts in English by strictly adhering to the journal’s publication style mentioned in the author’s guidelines. The submitted manuscripts will be published after getting final approval from the editorial board. The main objective of the journal is to cater to the academic and scholarly needs of the researchers, scholars, academicians, professionals and students by offering a competent forum for knowledge dissemination. 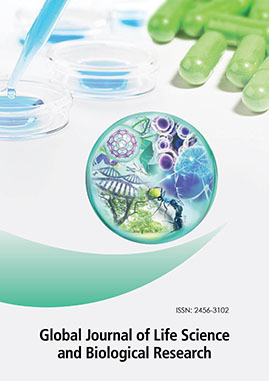 Global Journal of Life Sciences and Biological Research (GJLSBR) focuses on different areas, including but not limited to Advanced Techniques in Biology & Medicine, Advancements in Genetic Engineering, Advances in Crop Science & Technology, Advances in Dairy Research, Advances in Genetic Engineering & Biotechnology, Aging Science, Agriculture, Agro technology, Air & Water Borne Diseases, Animal Sciences, Antiviral & Antiretroviral, Anthropology, Aquatic Sciences, Bacteriology & Parasitology, Behavioral Sciences, Biochemistry & Physiology, Biochemistry & Analytical Biochemistry, Biocatalysis & Biotransformation, Bio-Discovery, Bioenergetics, Bioengineering & Biomedical Science, Biofertilizers & Biopesticides, Biological Systems, Biometrics & Biostatistics, Biomimetics, Biomaterials and Tissue Engineering, Biomolecular Research & Therapeutics, Biophysics, Bioremediation & Biodegradation, Biosafety, Biosensors & Bioelectronics, Biosensors, Biotechnology & Biomaterials, Bioterrorism & Biodefense, Cancer and stem cell research, Cell & Developmental Biology, Chemical science, Current Synthetic & Systems Biology, Cellular & Molecular Biology, Ecology, Endocrinology, Entomology, Environmental science & toxicology, Ornithology & Herpetology, Enzyme Engineering, Fisheries and Aquaculture, Fermentation Technology, Forest Research, Food & Nutritional Disorders, Fungal Genomics & Biology, Gene Technology, Genetic Engineering and Cloning, Glycobiology Health Issues & Care, Horticulture, Homeopathy & Ayurvedic Medicine, Swarm Intelligence and Evolutionary Computation, Biodiversity, Bioprocessing and Development, Immunological Techniques in Infectious Diseases, Lasers, Optics & Photonics, Liver: Disease & Transplantation, Marine Science, Membrane Science & Technology, Metabonomics & Metabolites, Microbial & Biochemical Technology, Molecular Biology, Molecular Imaging & Dynamics, Molecular Cloning & Genetic Recombination, Nanomedicine & Biotherapeutic Discovery, Nanomedicine & Nanotechnology, Nanomaterials & Molecular Nanotechnology, Nutrition & Food Sciences, Plant Sciences, Plant Pathology & Microbiology, Physiobiochemical Metabolism, Primatology, Probiotics & Health, Single Cell Biology, Sociology & Criminology, Tissue Science & Engineering, Tropical Diseases, Veterinary Science & Technology, Veterinary Science & Medical Diagnosis, Vitamins & Minerals, Virology & Mycology and Antiviral Research. Global Journal of Life Sciences and Biological Research (GJLSBR) is indexed by Cite Factor, SJIF, CROSSREF and Index Copernicus. Requests for permission to reproduce figures, tables or portions of articles originally published in Global Journal of Life Sciences and Biological Research (GJLSBR) can be obtained via the Editorial Office. Manuscripts submitted to Global Journal of Life Sciences and Biological Research (GJLSBR) should not contain material previously published in other publications, except as an abstract, and must not be currently under consideration for publication in another journal. Redundant publication is publication of a paper that overlaps substantially with one already published. When submitting a paper, authors should make a full statement to the editor about all submissions and previous reports that might be regarded as redundant publication of the same or similar work. Global Journal of Life Sciences and Biological Research (GJLSBR) considers research and publication misconduct to be a serious breach of ethics, and will take such actions as necessary to address such misconduct. Authors should refer to the Committee on Publication Ethics (COPE). Statements, opinions and results of studies published in Global Journal of Life Sciences and Biological Research (GJLSBR) are those of the authors and do not reflect the policy or position of the journal. Global Journal of Life Sciences and Biological Research (GJLSBR) provides no warranty as to the articles' accuracy or reliability.